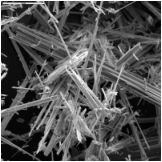 The inhalation of asbestos fibres can cause serious diseases of the lungs and other organs that may not appear until years after the exposure has occurred. For instance, asbestosis can cause a build-up of scar-like tissue in the lungs and result in loss of lung function that often progresses to disability and death. There are four main diseases caused by asbestos: mesothelioma (which is always fatal), lung cancer (almost always fatal), asbestosis (not always fatal, but it can be very debilitating) and diffuse pleural thickening (not fatal). According to the UK Health and Safety Executive, abestos-related conditions are responsible for about 4,000 deaths a year. How does exposure usually occur? Asbestos fibres are present in the UK environment, so everyone is exposed to very low levels of fibres. However, a key factor in the risk of developing an asbestos-related disease is the total number of fibres breathed in. Working on or near damaged asbestos-containing materials or breathing in high levels of asbestos fibres, which may be many hundreds of times that of environmental levels could increase your chances of getting an asbestos-related disease. Because of the risks of working with asbestos, there are a number of sets of regulations which place requirements on ‘dutyholders’ – employers and the self-employed. These cover working with all types of asbestos-containing material. A quick summary of these regulations can be found in the asbestos regulations section of the HSE website. PreviousPrevious post:Asbestos – Protect Yourself Now.NextNext post:Asbestos – Am I at Risk?